Isopogon formosus is a small, erect or spreading shrub that may reach a height of 1.5 metres and is known as the Rose Cone-flower. The young growth is silky and sometimes reddish. Adult leaves are green to reddish-green, very divided and each segment has a sharp point. Cone-shaped flower heads are six centimetres across, carried terminally or in upper leaf axils and are eye catching mauve pink. Bright yellow styles age to red. The flowering period extends from October to February. Flowers are followed by cones about two centimetres across. Each cone holds a number of small, hairy seeds. 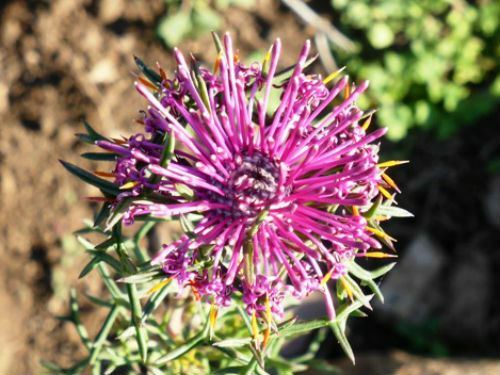 Isopogon formosus is a native of south-western Western Australia and is one of a number of attractive species from the west. The species was first introduced into England 1805 and is grown in California. We have had excellent success with cutting propagation.